This article is going to focus on a different part of the RPG business. 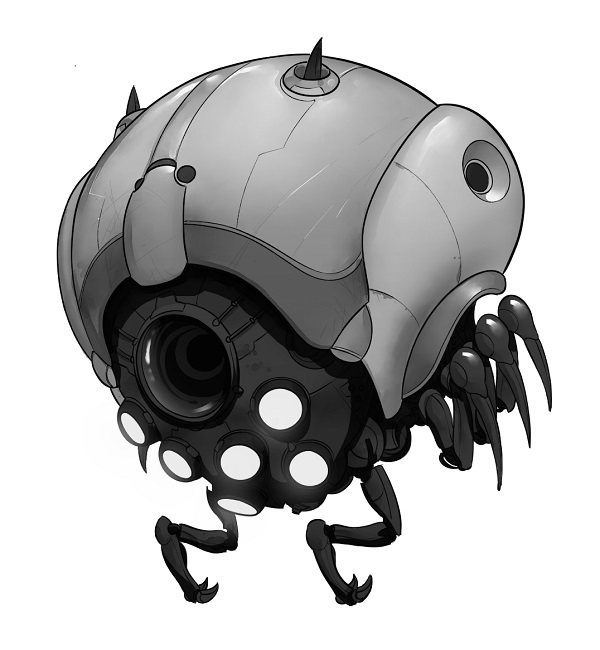 I have a science fiction game I am working on, I have Robots in the game and since I am using Open Game License content such as the D20 Modern Future Robots rules I have run up against some issues with that aging ruleset. Firstly I want to create a robot that flies and has a camera for taking video, there are other ideas for flying robots that illuminate the user’s path and free up their hands for holding weapons and equipment, but right now lets take the flying robot camera as our example. This was one of my early ideas for a Recon Drone, we’ll ignore his tiny Arms and Legs and the fact that this one uses Anti-Gravity propulsion for right now. Lets say that I want a Diminutive sized Armature Frame for 200 Credits, I have converted all of the Wealth Check values into cash because the game operates on a Cash basis and not Wealth checks. Further lets say that because I want the robot to be versatile and walk alongside the player I need it to be able to Hover as well as Fly, this makes Rotors seem the obvious choice among various low tech approaches available to me. Rotors cost One Quarter of the basic Frame cost or 50 Cr in this example. This Robot doesn’t need any Manipulators such as Hands. Our Robot doesn’t need any Armor, we don’t expect it to get into any fights and any armor we’d put on it would just weigh it down. Sensors, our Robot needs a Class I Sensor, basically a Low Resolution video camera and Audio pickup. That’s 275 Credits. For the purposes of this exercise our Robot is more of a Drone piloted by its operator and doesn’t need any programming, but it will need some extras in order to be remotely piloted. According to the Future Robots text I need a Audio Video Transmitter 650 Cr, Remote Control Unit 500 Cr and a Robolink 650 Cr. So I can understand why I need a Remote Control Unit, you can’t exactly Fly a remote controlled anything without the remote, and I can see why you’d need the Robolink because the remote needs to control something. What I don’t see is why you need to have the Audio Video Transmitter. People have been flying Remote Controlled Aircraft since the 1800s, First Person View flying didn’t come about until the last decade, so while it is Modern and one might even say Futuristic it isn’t absolutely necessary to see things from the Robots point of view as long as you can see where the Robot is. If I were building a Toy Race Car this probably wouldn’t even be something you would consider. For most of the history of Remote Controlled Aircraft even putting cameras on them wasn’t very practical so a case could be made for eliminating the Class I Sensor and the AV Transmitter. That’s 1,400 Cr for a Flying Drone I can fit in the palm of my hand and fly by remote. I can buy this exact thing (Size Fine, Diminutive because of its weight) from Amazon for $36.21 with Free Shipping in the form of the Hubsan X4 H107L Remote Controlled Quadcopter. It is a very basic Quad and it is often used by hobbyists to learn how to fly before buying and wrecking more expensive Quadrotor vehicles like the DJI Phantom which costs about $1,000 new. Now the X4 is pretty fragile, people break the rotors, people break the frame and have to replace parts of the shell and so I might give them the Fragile Quality and not a lot of Hit Points (maybe 2) despite that, it is not that bad a flying platform. Hobbyist equipment like this only gets about 7 minutes of flight time, but tell your average player he has 70 rounds of flight and see what they can do with that. Tell your average hobbyist that and he buys extra batteries. For $51.85 I can buy an X4 (H107C) with a video camera built in, but it only records what I fly it at, and I still have to fly the Quad by line of sight and retrieve the video from the memory card before the battery runs out. Some people only report 5 minutes of flight time, so 2-3 minutes out, 2 minutes back, but still how long does it take to see how many guards the bad guys have, how high the fences are, if there are guard dogs, barbed wire, or anything else a PC would try to scout in 50 rounds. Now the X4 with video doesn’t transmit any video back to me so still no 650 Cr AV Transmitter, but we do have that pesky 275 Cr Class I Sensor and a 275 Cr AV Recorder. So now we are up to a 1,950 Cr robot from the Future that does what a $52 toy from 2014 does. I’m not bagging on the guys from WotC that wrote these rules, Smartphones and Commodity electronics have done a lot to change the world we live in from the world of 2004. However as a guy that wants to write a somewhat convincing view of the future I need robots and phones that aren’t less capable than things the players might have at home or with them at the table. So now back to our Futuristic vision, lets take a look at First Person View flyers, our friends at Hubsan have done it again, they have a version of the X4 (H107D) that comes equipped with the same color camera from the earlier camera equipped version and it also will transmit a live video feed back to the remote. In order to do this you need one transmitter for flying and one for video, they operate at separate radio frequencies and thus they double the amount of radio gear on the Quad and the amount of electronics in the Remote Control Unit which now includes a full color video screen. this version also includes a larger battery pack which still has about 7 minutes of flight time, but has to power more gear. Add our AV Transmitter for 650 Cr to bring our total up to 2,600 Cr, how much does Hubsan charge? For an RPG Character in the Future 2,600 Cr, that’s a chunk of your starting cash or the reward for a few good missions. For a kid living in 2014, $163 that’s a couple weekends mowing lawns. The Robolink is overpriced because for what is over 2x the cost of the Frame, I get it included in the base cost of my $36 RC Quad, or even the $15 RC Helicopters and RC Racecars out there. Maybe 500 Cr is worth it if you have a 1:1 scale tank or starfighter and you have some Encrypted Signals so people can’t hack your connection and you use Frequency Hopping to avoid enemies jamming your multimillion dollar warmachine. At the low end we don’t need all that. I also notice that in the SRD you couldn’t build a Predator drone which was available at the time the SRD was written because Robolinks were limited to 1,000 ft range. So maybe we need to let control units just be control units and communications technologies like Satellite uplinks be their own thing instead of trying to bundle one thing with another. Remote Control Unit is overpriced, Hubsan replacement basic controllers are $20, the difference between a First Person View flyer without the remote and the full kit is $70 so even the full featured remote with twice the electronics and video display is basically $70. All the same caveats apply you could have high end military grade remote drone flying setups but there is nothing in the rules at the low end. The Audio Video Transmitter is not a requirement and should be decoupled from the Robolink at the low end. A Robot with a Robolink and no AV Transmitter could be paired with a low end Remote Control Unit. Since the Robolink only controls the robot, its costs should not go down significantly because of this only the prices of the Remote Control Unit should be changed to have various tiers related to their complexity. Robolink prices should still go down because they are batcrap crazy. There need to be changes to the prices of Robot Frames if they use replaceable batteries instead of large integrated batteries or internal power sources. I had already decided to do this for the Inflateable and Memory Material robots to make them fold up smaller and have more limited use. There need to be changes to the prices of Robot Frames if they are made out of injection molded or 3D printed plastic that can break easily instead of assuming a rugged metal frame as the baseline. I had already decided to do this for the Inflatable and Memory Material robots to make them fold up small enough to be carried in a backpack. The Diminutive Armature Frame I chose comes with a 5 Strength, it would be lightly encumbered by a load of 16 pounds or less, the X4 Quads can’t carry an extra ounce without throwing off their center of gravity and running down their batteries but they would still do the job I need them to and that is be my eye in the sky, maybe replacing the Futuristic Ranger’s Animal Companion. Which brings me to my last point, I have to pay more money to build a Remote Controlled Robot than a Semi-Autonomous Robot that responds to commands? Because my players might be used to the Ranger, Druid or Wizard having their Familiar/Animal Companion fly over the enemy camp and either signal based on a Trick it knows or share its senses with its master through Magic. A Robot with an AV Transmitter should be able to do all of this, but as it stands it is more expensive for me to build a Remote Control Drone to do this than add a Camera Transmitter to my Flying Autonomous Robot? So I think there need to be changes to the prices of Robot Frames if they are Remote Controlled instead of something that has Animal Intelligence and can autonomously follow rudimentary commands. 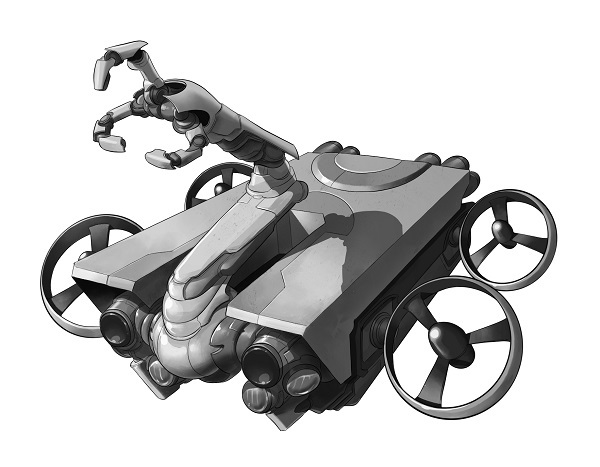 After reading the Pathfinder Technology Guide I have decided to build all Robots as Dumb Robots or Drones and then incorporate various degrees of AI to them in order to create Animal Intelligence and more useful robots. 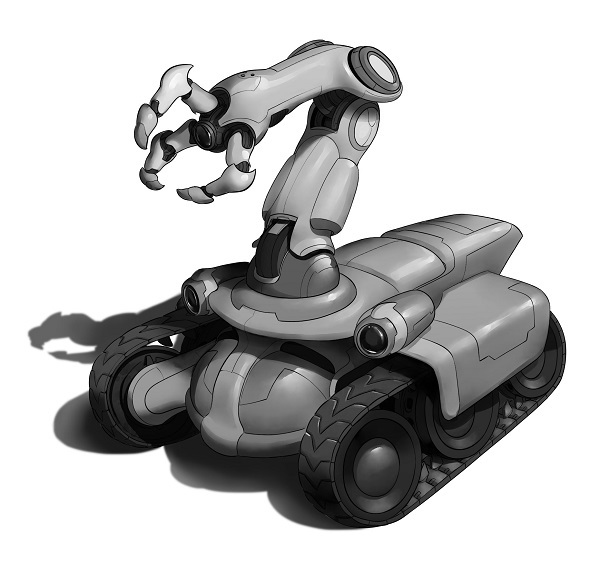 I did wonder about making a Humanoid Robot that could walk alongside my Player and cross any Terrain the player could and found myself wondering why I could buy Hands for Robots but the rules didn’t say anything about buying Arms. You can buy Claws, Hands, Pincers and all of those things let you attack (the game mechanical effect) and yet there must be an assumption that Arms come along with the price of the Hand you are buying. Even worse Medium sized Robots are limited to 2 Manipulators, so can I never build as Human sized Robot with both Hands and Jaws or should I assume that Hands and the Arms they are attached to come in Pairs? Because that would wreck my Demolitions Drone ideas. Heck it would even wreck my Underwater Demolition Drone ideas. Maybe I should just assume the cost of the Manipulators is the cost for a Pair of Claws, Hands or Pincers and that I could just buy one for Half the cost of a set. All in all there are going to be a lot of changes going on with the robot rules to make the costs of the cheap, disposable future more in line with the cheap disposable now and there are going to be some upgrades to the basic electronics so you hopefully don’t feel let down because your character’s commlink isn’t as gee-whiz amazing as your new smartphone. The images above is from an upcoming game about Pirates, Space Pirates! I hope this helps some of you out there working on your own RPG projects.